2-bedroom Apartment Overlooking Pools And Ocean. Great Views. 2-bedroom luxury apartment overlooking the beach and 2 swimming pools. Modern interior with home cinema and fully equipped kitchen, with water filter, ice maker, dishwasher and induction hob. Apartment with 2 bedrooms and 2 bathrooms. Front line to the ocean and the beach. Top quality with all conveniences. Enjoy your breakfast on the balcony while white sails cruise by on a vivid blue sea. Two complete bathrooms-- one with hydromassage column in the shower. Separate kitchen equipped with dishwasher, American fridge/ freezer complete with filtered water. Induction hob, oven and dishwasher, marble bench, spacious cupboards. The kitchen is equipped with crockery, cutlery, pots and pans, etc for 6 people. Laundry/utility room with fully automatic washing machine and tumble drier. Master bedroom has on-suite bathroom as well as TV. Both double bedrooms have ample closet space. The closest grocery store and restaurants are only 2 minutes walk - just a short walk along the beach around the corner. There are many restaurants and bars along Alcossebres beaches -- about 80 in all. Nightclubs open around midnight, and restaurants are open until the last customer leaves. Beaches are in abundance -- all with clean water and sand (or pebbles). Playa del Moro in front of the complex is a sand beach and has life guards during the Summer season. 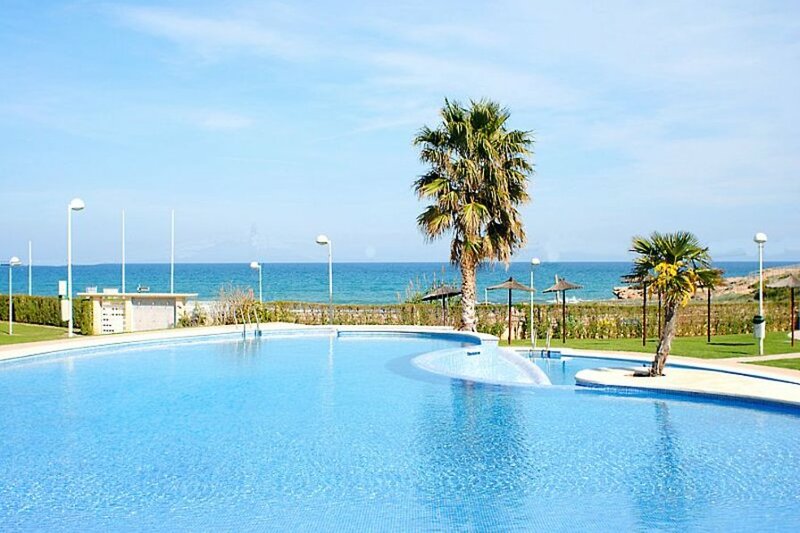 The apartment is situated facing both the larger and the smaller childrens swimming pool, as well as the beach straight in front of the complex. There are wonderful views from the balcony. There is a lift at the end of the block for easy access from the carport. Large park area for children to play and to relax on. Showers to clean off sand after a trip over to the beach are distributed around the garden and pool area.